Journeyman plumbers must serve an apprenticeship under the supervision of a licensed master plumber. To qualify for an apprenticeship, an individual must be 18 years of age or older and have a high school diploma or equivalent. Journeyman plumber apprenticeships typically last four to five years, during which the apprentice is paid about fifty percent of the wage earned by licensed plumbers. Classroom education usually includes pertinent subjects such as job safety, drafting, and plumbing regulations and codes. Those seeking employment at the journeyman level are also expected become adept at reading blueprints and building layouts. 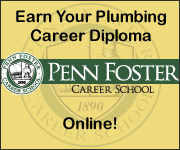 The education and training necessary to become a master plumber is similar to that which a journeyman plumber must endure, however the time frame in which one can obtain a master plumber’s license is significantly longer. Master plumbers typically complete an apprenticeship at the journeyman level, and then move on to complete additional years of training and experience in the field. A master plumber typically must complete a minimum of four to five years of an apprenticeship to be considered for licensure. Master plumbers’ knowledge and experience enable them to perform a greater amount of jobs and to complete more challenging plumbing work. Examples of such advanced jobs include drawing up complex plans for multi-level sanitary systems and repairing complicated storm sewer systems. � 2010 TestsDirectories.com LLC - All Rights Reserved. Beta Version.